Beautiful acreage within Keene city limits in prime development location at the intersection of 3 major thoroughfares: 750&apos; of Hwy 67 access road frontage; 950&apos; of Old Betsy Road (FM 2280) frontage; and 1340&apos; of Business 67 (Henderson St.) frontage. Zoned C-2 (Commercial)(Light Retail). 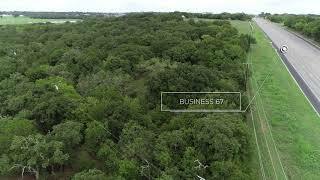 Property is 75% wooded with great hardwoods and over 70&apos; of elevation change. One stock tank. Water meter onsite. 12" water line directly across Business 67. Property includes old homesite that contributes no value.